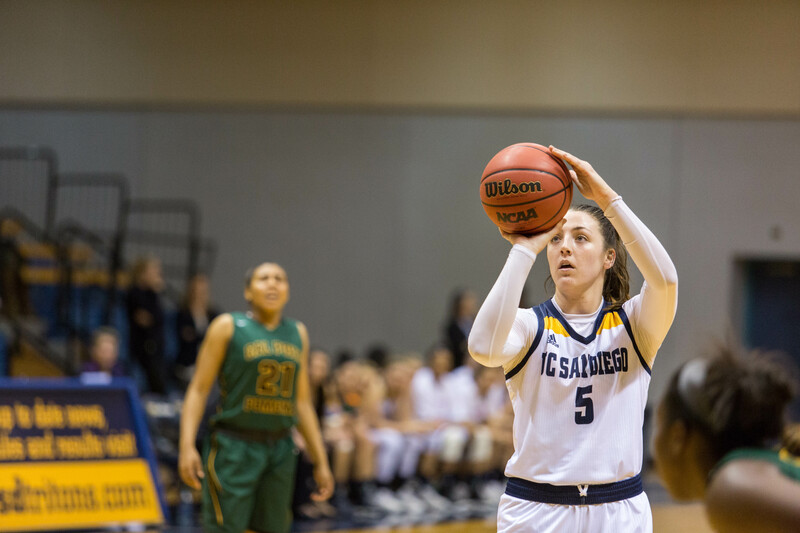 The UC San Diego women’s basketball team traveled to Anchorage, Alaska to begin its journey in the NCAA Division II West Regional, but its stay was cut short as they fell 69–65 against Simon Fraser University on Friday. The loss put the Tritons at 23–7 overall. The Tritons will have to wait until next year to give the NCAA Tournament another stab. Turnovers were the Tritons’ worst enemy that night, as they committed 17 turnovers and could not recover from their self-inflicted damage, even after shooting 42.4 percent (25–59) compared to SFU’s 39.7 percent (27–68). Those 17 turnovers led to nearly 10 more shots by SFU, which at the end of the day made the difference in a tightly contested game. Redshirt freshman forward Mikayla Williams led the way for UCSD, as she earned her second double-double of the season with 15 points and 10 rebounds in addition to a couple of blocks. Three other Tritons scored double digits: junior forward Dalayna Sampton (14), senior guard Beth Mounier (11) and sophomore guard Joleen Yang (10) all pulled their weight during the game. At the end of the night, the Tritons’ effort simply came up short and made for a disappointing end to the season, as the team looked to make progress in the tournament this year. UCSD can look back at its California Collegiate Athletic Association regular season title as perhaps the highlight of season, but will be looking to make some more noise in the NCAA Tournament next year. Other season highlights include head coach Heidi VanDerveer winning CCAA Coach of the Year and Sampton earning Newcomer of the Year. Mounier and Sampton were selected to the all-CCAA First Team, while senior forward Cassie MacLeod earned second team honors and Yang was given an honorable mention.